School administration addresses school shooting hoax - NCHS Live! Today in school, Principal Evans Branigan III spoke on the announcements to explain concerns stemming from a students Snapchat post claiming a school shooting was to take place in the near future at North Central. “The student references the race of the alleged perpetrator and provides the reason for the act as pertaining to some video,” Branigan said. The speculation arises from an explicit video released of a female student that could understandable cause frustration and anger towards her fellow students, thus providing a reasoning for a possible threat against the school. The school handled the situation swiftly and precisely, taking action as soon as they were first alerted. “Administration was alerted to the situation late Wednesday night and we had the young man who posted the alleged warning in the office this morning by 7:35,” Branigan said. 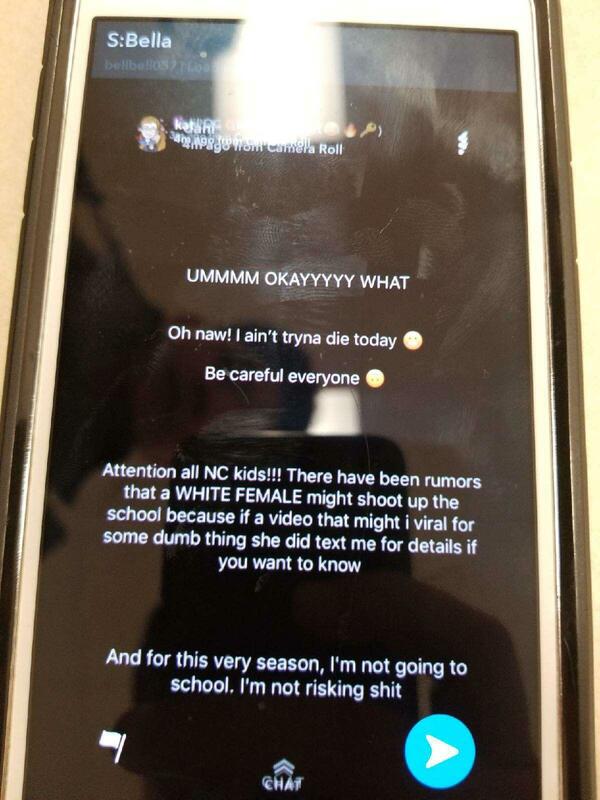 The school with no information to the situation, other than the post itself, was forced to treat the situation as a real threat to the safety of the school and student body. When called down to the office earlier this morning, the school was forced to treat the post from the student as a real, viable threat to school safety. “After a thorough investigation and collaboration with law enforcement, it’s been determined that the post is nothing more than a hoax and has done nothing more than cause concern in our learning environment,” Branigan said. The administration was alerted to the whole situation by a handful of concerned parents and students treating the Snapchat post as an actual warning rather than a call for attention. Administration has not taken lightly to the posting of a false warning that was knowingly made with no evidence to suggest a threat. “As for the student responsible for this post, let me assure you that an appropriate disciplinary response will be assessed,” Branigan said. Branigan encouraged the response of concerned students and parents alike, who brought the situation to the attention of the administration. “Thank you[those who reported the post], safety is our shared responsibility,” Branigan said.